in every student by living out the attitude, “Serving Others, while Developing as Leaders”. The academic curriculum allows for integrated character education and service opportunities in the classroom, while students are involved in service and leadership development through activities with clubs, organizations, athletics, and community service projects. Through partnerships including our sister school, Ricks Institute of Liberia, West Africa, and local partner, Fox Elementary School, students have the opportunity to develop relationships and serve locally and globally. WHY do we have Servant Leadership at Brookstone? 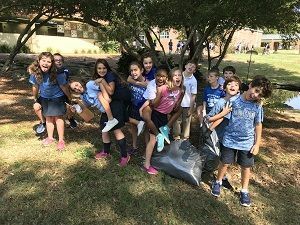 We focus on Servant Leadership at Brookstone because we desire to help others, make a positive difference and we want our students to develop and grow. We understand that education involves more than equipping students academically and we want to prepare our students to be engaged and active citizens through service and leadership opportunities. We focus on Servant Leadership at Brookstone because want our students to understand more about our community. We want to teach students about our local and global community and allow our students to be a part of something greater than themselves. We focus on Servant Leadership at Brookstone because serving others helps both those who are served and those who serve. Research supports that being involved with service increases beliefs that one can make a difference, improves the ability to express ideas, and increases empathy and awareness of community issues. WHAT is Servant Leadership at Brookstone? Servant Leadership is part of the culture and fabric of Brookstone and service is a core value of Brookstone School. It is just as visible on the sidewalks and playgrounds when students are helping peers, as it is when students are packing meals for those who are hungry or repairing a house for someone without a home. Focusing on others is the heart of Servant Leadership.